Our China Southern Airlines flight ($254 each) landed in Xiamen on a bright Sunday afternoon. We cleared immigration and collected our bags, and then checked back in for our connecting flight. We stopped at an airport tea shop and sampled some of China’s finest tea, but without knowing a word of Chinese, we found it awkward to excuse ourselves from the sampling table. Eventually we got up, said thank you, and made our way through security to the airport lounge for the rest of our 5 hour layover (Felix had some passes he had saved for just such an occasion). The second flight landed in Qingdao after dark, and we somehow managed to find the only English speakers in the terminal, who were friendly and helpful. We bought a local SIM for our phone ($23), a train ticket to Weifang for Tuesday morning, and a bus ticket to the center of Qingdao ($2.50 each). Our new friend sent us off with instructions for the bus driver to help us find our way to the hotel. When the bus reached its final stop, the driver got out, hailed us a taxi ($2), and gave him the hotel’s address. We arrived at the Hitime Inn ($25/night) tired, and although all we had eaten all day was snacks and airplane food, we were ready to just get some sleep. 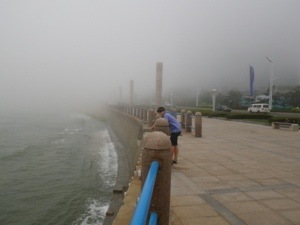 We awoke on Monday to a warm and foggy day in Qingdao. Thinking it would be easy to find a cafe for some breakfast, we ventured out by foot and wandered along the riverbank. The city surprised us with its modernity and cleanliness. It was, however, lacking in cafes (at least in the areas we were), so we ate some granola bars and continued wandering around. Eventually, we hopped on a bus (1 Yuan /$0.16 each) which brought us to the train station in the historic part of town. Hungry, after a 30 minute failed search for a restaurant where we could communicate “vegetarian”, we found the food court of a local department store / mall. Here, we were able to point to various raw veggies and tofu, which the lunch lady stir-fried with some herbs ($4.25). It was actually pretty good for our first meal in China, and we felt refueled and confident once again. Qingdao was once a German colony, and the influence has endured in the architecture, the churches left behind, and the beer culture. We wandered along the main street, lined with buildings that seemed to belong in a European town, stopped to take a photo with one of the many bride & groom couples outside an impressive church atop a hill, and hopped on a bus ($0.32) toward the brewery. 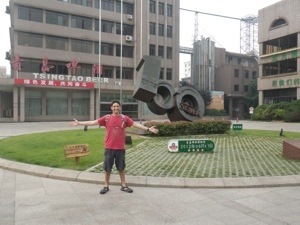 The Tsingtao Brewery tour ($10 each) included an interesting museum detailing the history of the city and the brewery, which are very much intertwined. Then, the second part of the tour brought us into the brewery itself, where we learned how beer is made, and sampled two versions of Tsingtao: an unfiltered version (freshly made, cloudy in appearance and absolutely delicious) and the regular draft version (clear, crisp and pretty good). The unfiltered beer is unfortunately available only in Qingdao, so if you make it there, make sure to get your fill. As we left the brewery, the rain began to fall and by the time we reached the main street it was a proper downpour. The pesky rain deterred us from finding the right bus, and we took a taxi ($2) back to our hotel for a rest. Tired and not feeling like walking in the rain, we hoped to find dinner nearby our hotel. We picked a random restaurant and entered a tree-house realm like no other. Down a winding wooden staircase was a multi-level wood creation, full of booths and grottos, accented by colorful twinkle lights. The waiter brought us to a large bright room with all sorts of sample dishes to choose from. Being a seafood town, there were also many interesting (some might say disgusting) sea creatures available in tanks around the edge of the room. We settled (through some written notes, English words and pantomime) on broccoli with mushrooms, spicy tofu, noodle soup and rice. 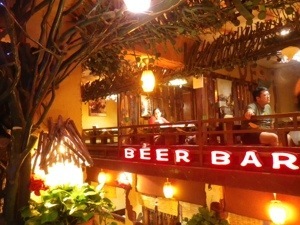 Together with a pitcher of beer, it was way too much food, and yet the experience of this cool place was totally worth it ($13). We left early on Tuesday morning and walked in the rain to catch the bus to the train station ($0.50). It was miserable. Eventually, the bus arrived and we were on our way. The train station was mobbed. First, we went into the ticket hall entrance, but quickly realized that there were way too many people and we had a train to catch. After waiting in line in the rain, we entered the station, cleared the annoying security check, and found our gate. The K train ($5 each) ride was an uneventful two hours and we arrived at the Weifang train station just before 1pm. We had come to Weifang in order to visit Amira, Felix’s cousin who was teaching English at a high school in a small village about an hour away. We were so excited to see Amira and spend some time with family. This was this first time since we left for our trip that we were going to see someone we knew from “real life”. Following Amira’s directions, we found local bus 68 and hopped on for the hour ride. 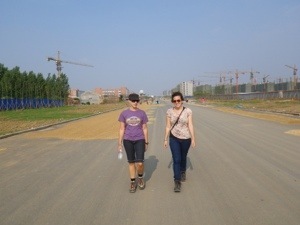 It was fascinating to see what the Chinese countryside looks like in 2013. Once outside of the city, wide 3-5 lane roads opened before us as we drove past high rise developments and massive construction sites. The infrastructure was astounding and at the same time, it seemed oddly vacant. As the bus pulled into the final stop beside the Xiashan Reservoir, we quickly jumped off the bus and into a big hug from Amira. She took us in a car the school had sent to see where she lives and meet her friends. 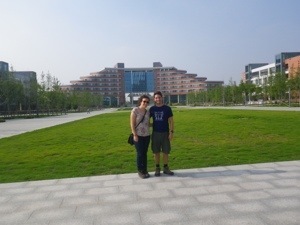 The school’s campus was brand new with beautiful landscaped gardens, fountains, and an artificial stream. Amira’s room, located on the third floor of the administration building which was so new that was mostly empty, was vast yet sparsely furnished. A room across the hall had been converted into a makeshift kitchen for “Foreign Teachers 1 & 2” (Amira and her friend Neta, who had come together from Israel), and the sparkly new bathrooms had only squat toilets (much to Jordan’s dismay). The routine of Chinese high school life resembled military training more than what Westerners think of when imagining a boarding school. Loudspeakers hidden around campus broadcast chimes, school bells, and accompany daily activities, such as the mandatory eye exercises, English vocabulary over lunch, and a twice daily outdoor exercise drill. This was no ordinary phys. ed. class – it was more like Zumba meets marching band. Thousands (literally, thousands – Amira estimated 6,000) of students poured out of the classrooms and filled the courtyard, stood in formation, and proceeded to jump, skip, clap and shimmy in a choreographed routine to a bouncy modern tune. What a site to see. Apparently it gets old after a while, but we weren’t there long enough for that to happen. That evening, Amira, Neta and their friends, YoYo, NaNa, and JinJing, who are all first-year teachers, took us to THE restaurant (there is only one for miles around) for a classic Chinese dinner. The family style meal was full of interesting flavors and explanations of the various vegetarian dishes we tried. We enjoyed a traditional dish of egg and tomatoes (think Chinese shakshuka), braised eggplant, fried snake beans, candied yams and more. Dessert was a huge plate of dumplings filled with egg and scallions. Not our idea of dessert, but interesting nonetheless. The evening was filled with great conversation, Chinese language lessons which were really helpful, tons of food, and lots of laughter. 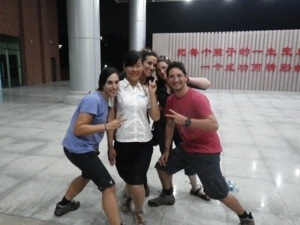 We took some fun pictures and learned that in China they say “qiezi” when posing for a picture. It sounds similar to “cheese” and one’s mouth forms into a smile when saying it. The best part is that it means “eggplant”. Saaaay… Eggplant!!! It was great to have some new Chinese friends. The next day, we made coffee and ate our breakfast of yogurt ($1.50) and granola in Amira’s room and hung out until Amira came to pick us up for lunch. The cafeteria building is divided into multiple lunch halls serving various meal plans, some better and thus, more expensive than others. The teachers’ area was mid-range, but being vegetarian, Amira ordered tomatoes and egg which she enjoyed with her favorite Chinese food, manto (plain steamed bun). Jordan avoided looking around so she wouldn’t be grossed out by the slurping and other mouth noises as food lay planted or dripping down students’ faces. While it’ll never be Zagat rated, hey, you know us, the price was right. That afternoon we went for a walk with Amira to the reservoir and had some ice cream bars ($0.50 each) along the way. We walked along the wide and empty roads, which were filled with grain laid flat to dry and farmers with straw baskets and old tractors standing around. It was fascinating to observe the way they are coping with the rapid development of their countryside home, as cranes and construction crews erected towering apartment buildings and man-made gardens in neat chunks all around them. The school campus itself rests on the site of a former village, which was cleared after its residents were moved into a nearby development. These villages, also rows of identical two-story buildings arranged in a neat grid, are the result of a similar process undertaken in the 1970s. Our new Chinese friends shared their take with us, saying that while some locals think the old ways are better, most believe the government is helping them toward progress by resettling them in tall new buildings. On our way back from our walk, we stopped by the village for some groceries and dinner. The local street-side BBQ joint boasted a variety of skewers (meats, seafood, tofu, veggies and mini-pita) all doused with the same salty rub. 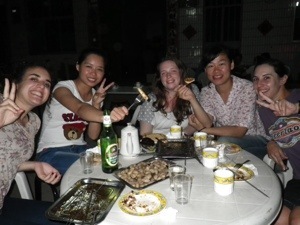 Neta, YoYo and JinJing joined us, and we treated all our hosts to a round of Tsingtao beer and a BBQ feast ($16). We enjoyed the grilled cabbage, mushroom variety, tofu, eggplant, pita and more, but decided that in general, the food all had the same salty flavor, which got boring pretty quickly. We were happy to have an authentic Chinese BBQ experience, but decided once was enough, and that we like our version of BBQ better. Needing to balance out the salty flavor in our mouths, we made a bee-line for the school supermarket and got some ice cream (surprise, surprise) to finish off the night. We awoke early on Thursday morning and followed Amira to class. On a mission from her father, Felix recorded videos and took many photos, much to Amira’s embarrassment. The lesson and the teacher were both very animated, and we even got a chance to participate in an activity and speak with some of the students. Once again, we felt like celebrities as many students were eager to interact with us and even asked us for our QQ (Chinese IM) and Sina Weibo (Chinese Facebook) accounts. Back in the cafeteria, we congratulated Amira on a job well done over the same meal as the day before (and every day, apparently). Later in the evening, Neta, Amira and us turtles went in the school car (complete with driver) to the nearby larger village of Zuoshan, where we were joined by Charlotte, a British girl who was volunteering in the school there as part of the same program as Amira and Neta. This was our first introduction to the Chinese Muslim noodle shop. It did not disappoint! We enjoyed vegetarian noodles in broth with egg and a spicy tomato noodle dish (Amira’s treat) – both were excellent. The coolest part was watching the owner make the noodles to order by smacking the dough on the countertop and stretching it into thin strands. This talent, which the Muslims in China have cultivated, produced a delicious result, and it’s clear why they have successfully cornered the national noodle market. After a relaxing few days it was time to head to the big city. We packed our bags and headed downstairs to the brand new faculty lounge, where JinJing joined us as we had a breakfast of yogurt ($1.50) with granola and tea. All our new friends came to see us off and together with Amira we walked to the school gate. There, we said our goodbyes and got into the taxi ($1.60) which took us to the bus stop. We retraced our steps on bus 68 to the Weifang train station and boarded the G190 train ($42) to Beijing. Felix was very excited to be on a bullet train, and the journey to Beijing South Railway took under 3.5 hours at over 300km/hr. We navigated our way out of the station and through a long queue into a taxi, which took an hour ($20) to bring us to our next destination in the north-east part of the city. Having experienced a small city and a village, we were excited to explore the famous large metropolis of Beijing.